The founders of jug productions in Boleráz were descendants of Hutterite jug makers in the 18th century. The Boleráz sigma soon became synonymous with quality of jug making work. The share in fame did not only belong to the member of the significant jug-making family Kitta, which was active in Boleraz from the last third of the 18th century, but also to the insurmountable factor of differentiation of the local ceramics production. Workshop of Boleráz belongs to those jug making communities that were majorly influenced by the Holíč manufacturing. Holíč factory's production of faience dishware was considered a big source of inspiration. The Holíč products were not only influenced by the leading European production workshops but oriental work and patterns as well. Part of the collection of the Museum in the castle of Červený Kameň in Častá, are artifacts that embody the quality of artistic-craftsmanship processing which was signature to its heritage in the Holíč factory for faience dishware. They are however the two products of Boleráz masters, thus clearly demonstrating the massive effect Holíč manufacturing had on local jug makers. 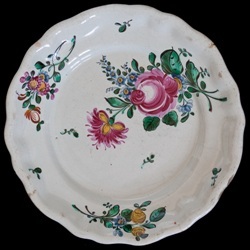 One of the pieces is a round plate with an octagonal hatch to serve as a serving dish. The fact that the pieces have been preserved in the Museum's collections fund speaks for the fact that the buys of Boleráz jugs were not only rural and townspeople and landowners, but members of high nobility as well.